Grand Lisboa Casino (新葡京) is located in the heart of Macau, where this stunning building in the shape of a golden lotus leaf dominates the local skyline. 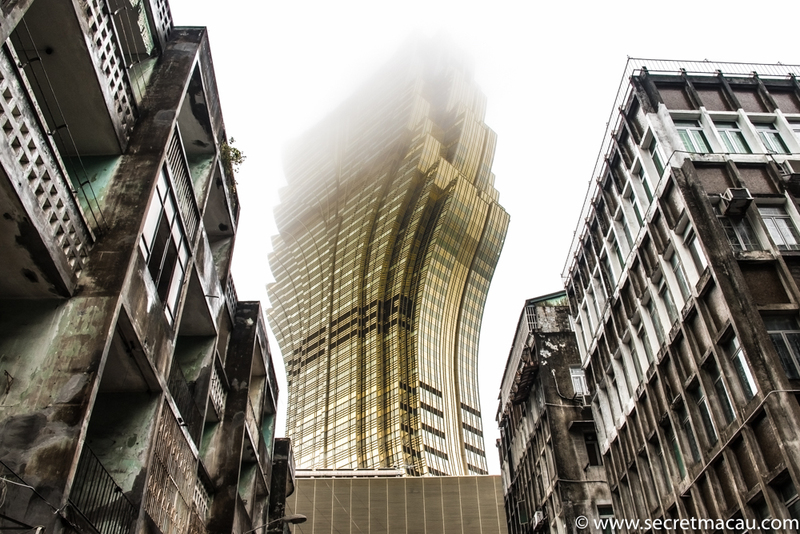 I think this is my favourite building in all of Macau. It can’t compete with the new casinos on the Cotai Strip for sheer scale and ambition, or with the traquil beauty of the historic centre, but there’s just something a bit crazy about it that’s hard not to love. The fact that it’s right in the heart of the city centre too, some of the view of it from down amongst the narrow streets are just breathtaking. There’s a hint of Bladerunner about it too. Whether shining bright gold during the day, or a towering neon obelisk at night – it can provide a useful guide when trying to find your way among a warren of streets that often look all too similar. At the turn of this century, Hong Kong’s Stanley Ho was the richest man in Macau. His business, Sociedad de Truism e Diversoes de Macau (STDM) had a monopoly on all gambling in Macau. This ended in 2001 following the handover of Macau by Portugal to China, who immediately changed the gambling laws and opened up the market to foreign investors. Of course, the big players from the US moved in, and in the following years Las Vegas Sands, MGM Mirage and Wynn International constructed their own huge hotel complexes in Macau. 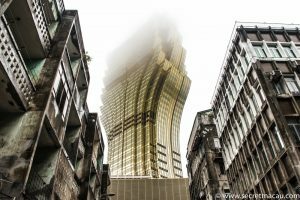 Stanley Ho responded in 2006 by beginning the construction of the Grand Lisboa, designed by Hong Kong architects Dennis Lau and Ng Chun Man (DLN). 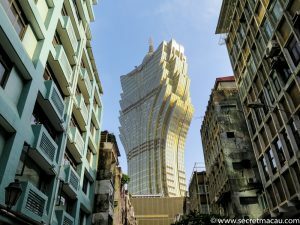 Costing an estimated $385m, at 261m tall, with 47 floors it was the tallest building in Macau when it was constructed (only now beaten in height by the near Macau tower). The Star of Stanley Ho is on permanent display at the Casino Grand Lisbon, and according to the Gemological Institute of Amerix the 218.08 carats diamond is the largest cushion shaped internally flawless D-color diamond in the world. There are a number of high quality restaurants in the Grand Lisboa. 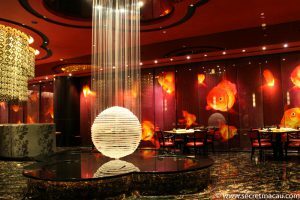 One I’ve been to for lunch a number of times is ‘The 8’ – which is the first and only Chinese restaurant in Macau awarded 3 Michelin stars. It’s in a lovely dining room, with a great animated fish floor in the entrance hall. Prices are reasonable, style is very casual and there is a fantastic selection of really top quality dim sum to select from. Grand Lisbon offers a free two-way free shuttle bus service from Macau Airport, both Ferry Terminals and the China Border Gate. 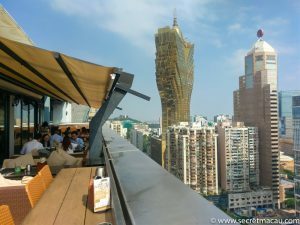 It’s easily walkable from the Historic Centre of Macau. 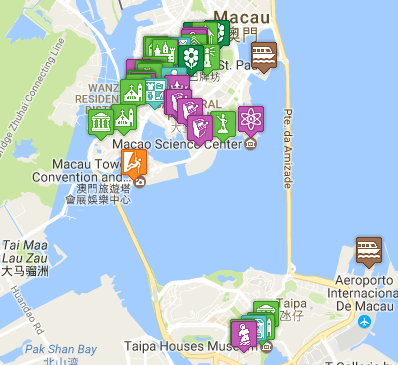 It is right next to the main public bus stop in Macau, Praca Ferreira Amaral.